We know that Jesus had left the disciples in Jerusalem with the instructions to meet him in Galilee. Jesus had met with most of the disciples, excluding Thomas, on the evening of his resurrection (John 20:19-25) . He then met with them again, including Thomas, eight days later (John 20:26-29). Afterward, the disciples journeyed to Galilee where the scene in John 21 took place. Peter announced that he was going fishing (on the sea of Galilee) and six other disciples joined him. Many commentators believe that the two unnamed disciples here are Philip and Andrew. Therefore, the disciples that morning consisted of: Peter, Thomas, Nathanael, James, John, Philip, Andrew. Many Bible scholars have debated over the details of Peter’s actions. Why did he go fishing? Was Peter disobedient in doing this? Why did the other disciples follow him? Jesus instructed the women after the resurrection, “Do not be afraid; go and tell my brothers to go to Galilee, and there they will see me” (Matthew 28:10). Using this reference, some Bible scholars believe that Peter was disobedient in going fishing. However, the problem with this argument is that we have very little detail about Jesus’ command. Peter was in Galilee waiting for Jesus, and there was nothing in Jesus’ command which prohibited them from other activity while they waited for Him. Also, Jesus never rebuked their actions. The entire theme of John 21 is of consolation and restoration. Therefore, it is best to understand that Peter and the other disciples were not being disobedient when they went out at the lake. Why did Peter go fishing? We can only guess what Peter’s intentions were at this time. Peter may have been looking for a way to pass the time and pay the bills. Peter also may have wanted to go back to familiar territory after everything that happened, and so he returned to the profession that he knew best. Either way, the disciples found only frustration that night on the water. They spent all night fishing in familiar territory and yet caught nothing. The “Sea of Tiberias” is another name for the Sea of Galilee (see also John 6:1). Just as day was breaking, Jesus stood on the shore; yet the disciples did not know that it was Jesus. Jesus said to them, “Children, do you have any fish?” They answered him, “No.” He said to them, “Cast the net on the right side of the boat, and you will find some.” So they cast it, and now they were not able to haul it in, because of the quantity of fish. In the early morning light, a stranger called out to them from the shore, “Children, do you have any fish?” The stranger then instructed the fishermen to throw the net on the other side of the boat. The men did not recognize the stranger yet they obeyed, and caught so many fish that they could not haul the nets back into the boat. That disciple whom Jesus loved therefore said to Peter, “It is the Lord!” When Simon Peter heard that it was the Lord, he put on his outer garment, for he was stripped for work, and threw himself into the sea. The other disciples came in the boat, dragging the net full of fish, for they were not far from the land, but about a hundred yards off. It is the disciple John who recognized the stranger at this moment – it is the Lord! Peter then did a most unusual thing: he rose from the fishing, put on his coat, and jumped into the water! Why does Peter get dressed before jumping into the water? We can only guess, but some Bible students have proposed that Peter may have hoped, in the excitement of seeing Jesus again, to walk on water one more time. While Peter swam the hundred yards to shore, the rest of the disciples followed in the boat, dragging the fish. It is unusual that the disciples did not recognize Jesus until after the catch of fish. They had already seen him after the resurrection so he could not have been physically different. The disciples were waiting for Jesus in Galilee, so they were not taken by surprise by his appearance. This is one more instance where the we see that Jesus prevented people from recognizing Him until He wanted to be recognized (see here). Note also that He was a distant figure in the early morning mist, so it would have been easy for Him to go unrecognized. Jesus already had a fire for them with fish cooking on it. 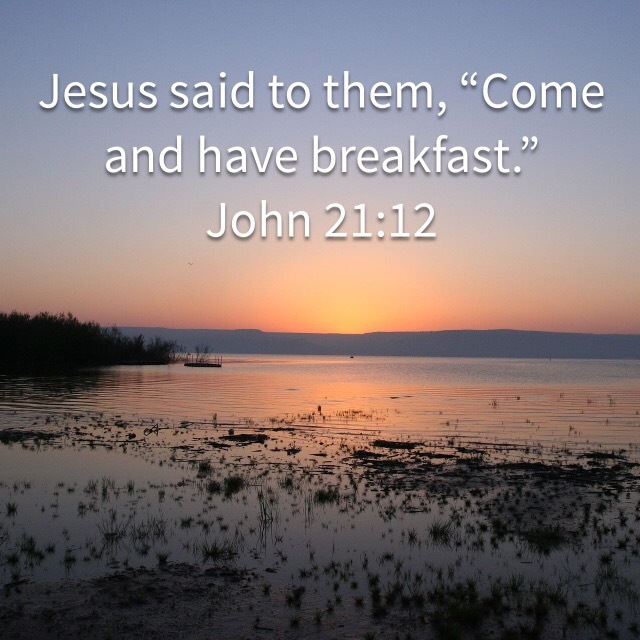 Note that Jesus had breakfast for them before they brought the fish ashore. Therefore, Jesus had personally provided a fish for breakfast, that was not caught by the fishermen. John was very specific about the details of that morning, including the number of fish that they caught (153). This is one example in this gospel account to show that it was written by an eyewitness of the things that had happened. The disciples were unable to physically recognize Jesus, yet they knew that it was Him. He did not let them recognize Him physically, but they knew Him by his actions and his caring for them. This had to have been a very difficult time for Peter. Peter still had his three denials of Jesus Christ ringing in his ears and he saw his Lord and Master suffer and die on the Roman cross. Jesus had risen again, but Peter had only been able to see him briefly for three times. Peter had tried to defend Jesus, to fight for Jesus, and he vowed that he would never leave him. Even now, after the resurrection, Peter could not even be a good fisherman. He had led the other disciples on a fishing expedition which yielded nothing. Jesus had a question for Peter. “Simon, do you love me?” This short exchange straits directly at Peter’s heart, laying open his broken present, the rashness and boasting of his past, and the man he was when he first met Jesus. Jesus asked Peter, “Do you love me more than these?” Jesus was asking Peter for total commitment (agapaō, ἀγαπάω). Peter replied with, “Yes, Lord, you know that I love you.” Peter replies with deep affection (phileō, φιλέω). Jesus asked a second time, “Do you love me?” Once again, Jesus asked for total commitment. Peter replied again, “Yes, Lord; you know that I love you.” Peter replied again with deep affection. Jesus asked a third time, “Do you love me?” This time, Jesus did not ask for total commitment but asked about Peter’s deep affection. Peter was grieved at the third time and replied, “Lord, you know everything; you know that I love you.” Peter replied with the deep affection. Jesus’s words used the highest form of love. He asked Peter if he can really commit to him with all that he has. Peter’s response was with deep affection but not total commitment . After all his boasting, Peter knew that he cannot commit to Jesus with the love that is Lord requires. Most Bible scholars agree that Jesus was addressing Peter in the context of his failures. Peter has not been the “rock” that Jesus called him to be (John 1:42, see here). That may very well have been why Jesus addressed him with his original name, “Simon”. Jesus never scolded nor rebuked Peter for his inability to confess total commitment. Instead, he redirected him. Show your love for me by taking care of my sheep. There is a close parallel between Jesus’ questions and Peter’s denials. Peter had denied Jesus three times at His arrest, and now Jesus asked Peter to affirm his love for him three times. Peter’s threefold denial might have been the reason for Jesus repeating the question to Peter three times. However, the best explanation for this repetition is to be that Jesus was emphasizing His point. What matters most is that we love him! Peter had previously boasted that he would die for his Lord. Jesus now promised that Peter will have that chance. Peter is to live a life of loving his Lord and feeding His sheep. When Peter is old, he will die a martyr’s death for Him. But what must Peter do with this knowledge? He must follow Him. Not one time, but always — keep on following Him! This is as close as John gets to signing his own name to this gospel account. John is the one who has written these things, and his testimony (John’s) is verified to be true. John concludes with the reminder that this is far from a comprehensive biography. There are not enough books in the world to write a complete account of the Lord Jesus Christ! “Do you love me more than you love these fishing nets?” In this case, Jesus would be asking Peter if he is ready to leave his fishing profession. “Do you love me more than you love the other disciples?” In this case, Jesus would be asking Peter if his love for Jesus is supreme over his love for other men. “Do you love me more than these disciples love me?” In this case, Jesus would be asking Peter if he still thinks he has a greater love than the other disciples. My preference is for this interpretation, since this fits in the best with the rest of the passage. The rest of the passage is about Peter’s level of love for Jesus, and it is in contrast with Peter’s previous boasting and denying Him. We do not know the actual time frame of the events in John 21. We know that Jesus was in Jerusalem for the final week before the crucifixion (John 12-18), and that the disciples stayed at least eight days after the resurrection before journeying to Galilee (John 20:24-29). Acts 1:3 tells us that Jesus was on earth for 40 days after the resurrection. The disciples traveled to Galilee after His second appearance to them, and it was in Galilee that they met Jesus, as told in John 21. The disciples would have needed time to prepare for the journey back to Galilee, at least two days of travel (depending on the route taken), and time to settle after their arrival. Therefore, I am assuming for simplicity that it had been about three weeks since Jesus entered Jerusalem, or two weeks since the resurrection.